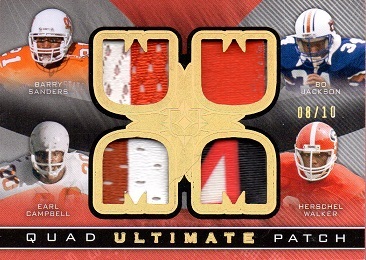 This card features a jersey patch worn by Barry Sanders, Bo Jackson, Earl Campbell and Herschel Walker. As I've discussed before, the Ultimate Series has a bunch of subsets. There's Dual Patch and Jersey; Triples Patch and Jersey and Quad Patch and Jersey, along with autographed examples. 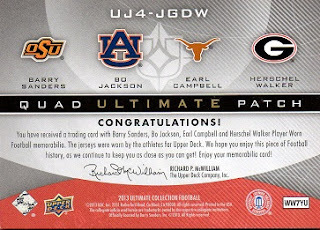 Different players are also shown, Billy Sims, for example, is on one card, Sanders, the other. I now have both the jersey and the patch cards in the Quad. 1991 Pro Set Pack Break Card #'s 13 and 14.